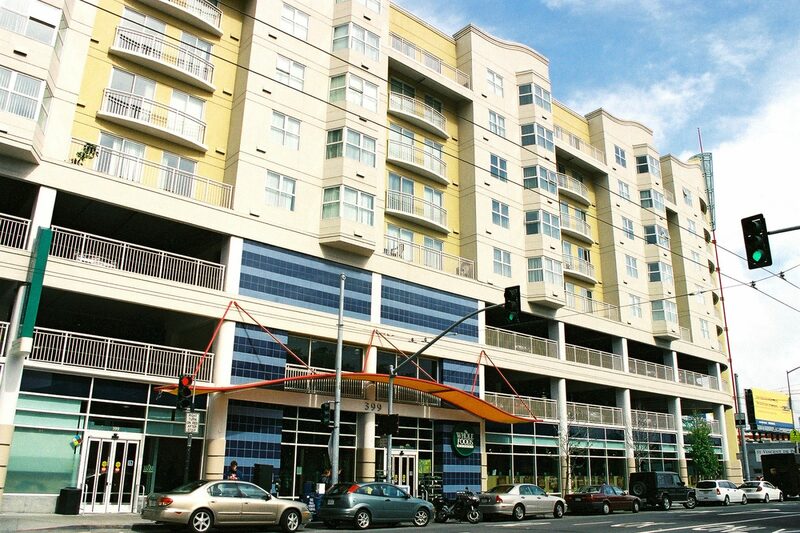 Completed in 2000, Bond Companies developed an eight-story, mixed-use building located in the heart of the South of Market Area (SOMA) in San Francisco, California called The Aurora. The 250,000 square foot property is anchored by a Whole Foods Market and contains 160 residential units in the top five floors of the mid-rise building. The property is located on the northwest corner of Fourth and Harrison Street, one block east of the Moscone Convention Center. Amenities include a central management office for the apartments; a state-of-the-art fitness center serving the residents; a two-level, 160-car enclosed parking garage; and great views of the San Francisco skyline and bay. Being the catalyst to change an area suffering from a prolonged decline was the goal. Providing the first large-scale grocery store to the community was essential both for this development's residential units and many others in the vast sea of affordable housing dotting the landscape in this part of town. Bond Companies, for its work, was named by a senior citizen non-profit organization as its "Developer of the Year." The end result has been that this project has transformed the area and has lived up to the lofty expectations of the community.